Running late but still need to look put-together? These'll work! The products in this post were updated in March 2018. 1. Use an elastic headband to create an under-two-minute updo — no bobby pins required. Use a plain headband for an everyday look, or bump it up for an event-worthy updo with an embellished or sparkly version. Check out all the tutorial details at Hello Glow. 2. Create four sections of hair, braid or flat-twist them, and pin them into place for a "ridiculously quick" (and also ridiculously gorgeous) crown halo style. Check out the how-to (complete with helpful video) at Klassy Kinks. 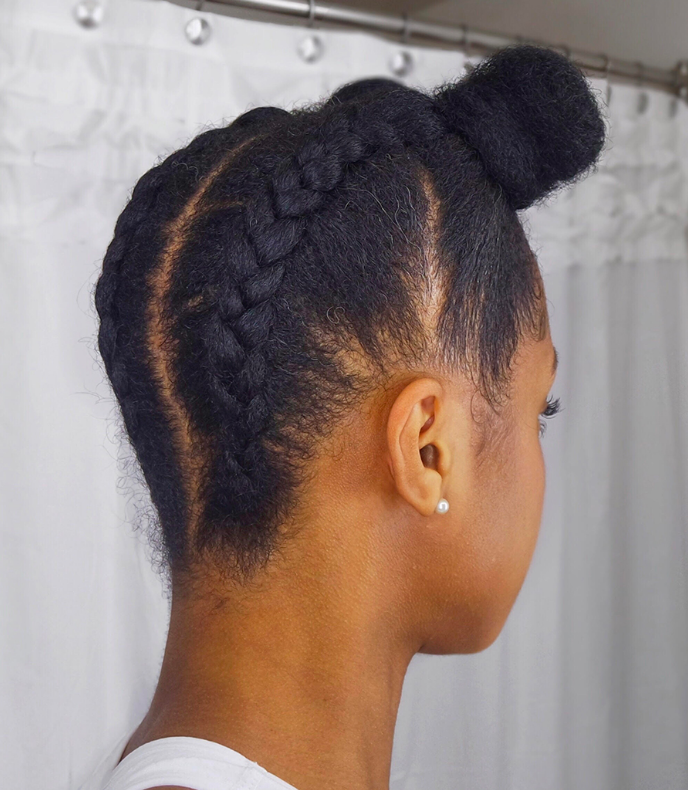 She recommends applying an elongating gel to the sectioned areas before braiding or twisting. You can use a rattail comb to section off the parts, but fingers always work too! 3. Turn post-gym wet hair into an effortlessly cool look: Just make a high ponytail, braid it, and wrap the braid into a bun. DONE. Learn more about recreating this style here. 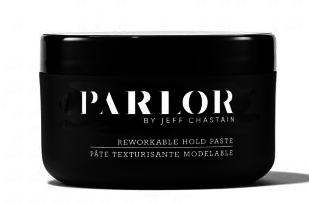 Tame any potential flyaways in the front with some hold paste. And keep a little box of bobby pins in your gym bag or purse so you can add as many as you need. 4. Recreate a vintage-inspired hairstyle with a modern twist: Just roll up a section of hair and pin in place. One of the easiest ways to get a voluminous look with 0.0 effort. 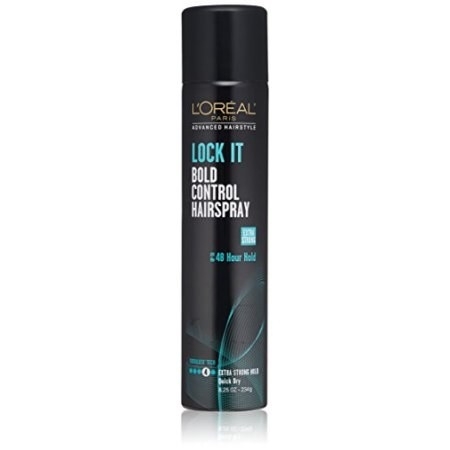 Secure with a strong hold hair spray for an all-day style. Learn how to recreate the look at Overtone. Wondering what hair color she used? It's Overtone's Vibrant Orange. Get the whole hair color set (including conditioner and deep treatment) from Overtone for $45. 5. 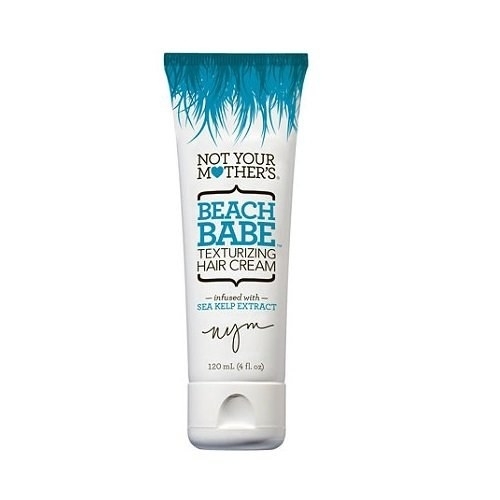 Want beachy waves? Just sleep on it! 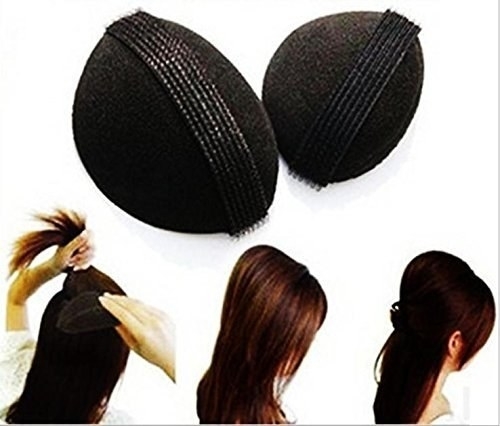 Dampen hair, separate into two sections, twist, and pin to the top of your head. You'll wake up the next day with perfect no-heat waves! Check out the no-effort tutorial at Song of Style. 6. 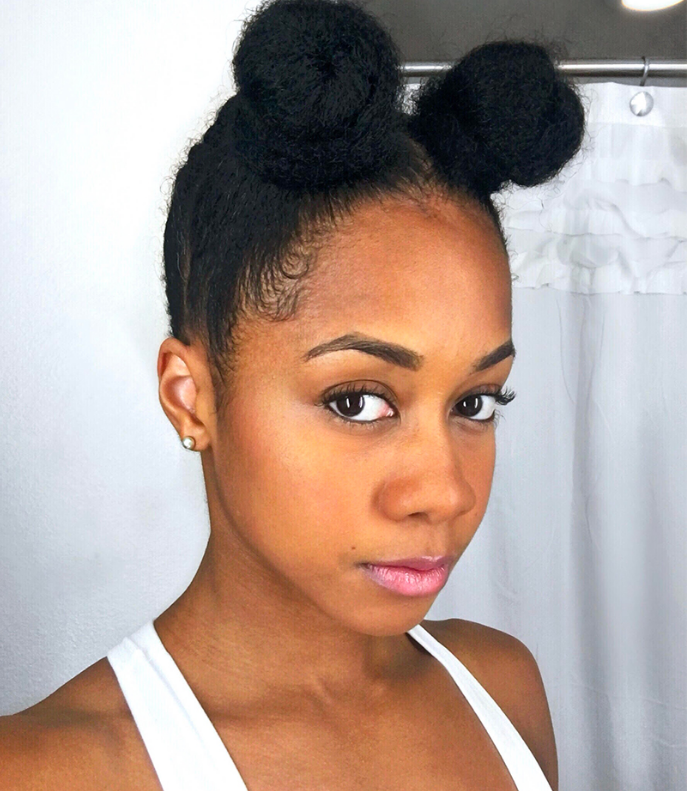 Create insanely adorable space buns by separating your hair into four sections: Braid the back two and wrap the front two into two buns. That's it! Get all the steps at My Natural Sistas. 7. Use a vintage roll kit to transform your hair into a '40s style in just four steps. A great way to create a thicker-looking updo for shorter hair! Check out this video for all the steps. Get the Conair kit she uses in the tutorial from Walmart for $5.99. 8. When your second- (or third-) day curly hair is a little frizzy in the front, twist two front sections and fishtail braid them in the back for an easy but special 'do. Because you're definitely not quite ready to wash it yet. Get all the inspiration at The Merry Thought. Wondering how to do a fishtail braid? 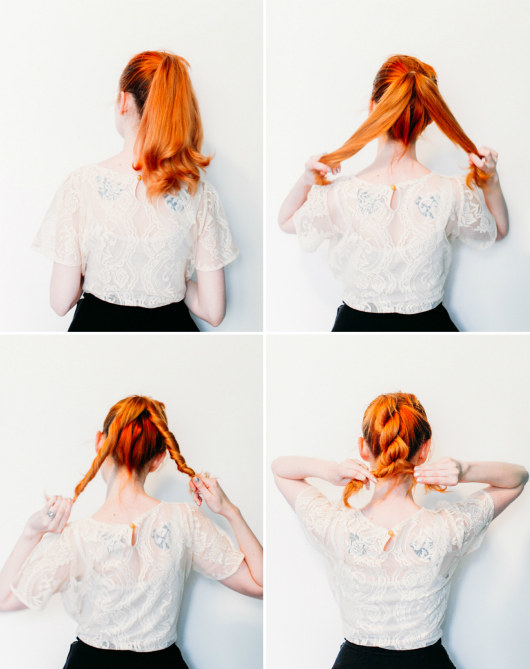 It's actually even *easier* than a regular braid. Just take two sections, wrapping hair from one side to the other over and over. DONE. 9. 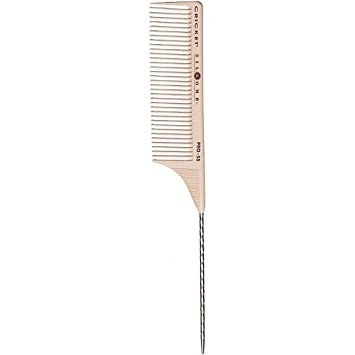 Wow everyone around you by creating a surprisingly simple fauxhawk with a few side combs and some moisturizing cream. 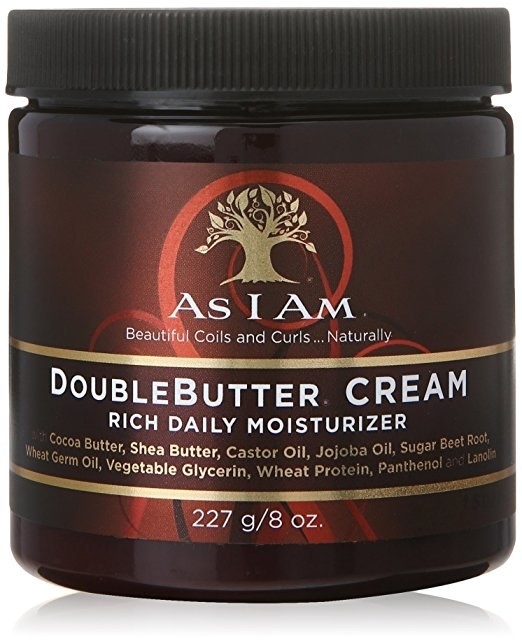 Tutorial creator Nathalie Holmes recommends As I Am Double Butter moisturizer to help shape your look. Check out all the steps to this 'do at Camille Styles. 10. Upgrade a standard ponytail braid by using a rope-twisting technique instead. Learn how to do it at A Clothes Horse. 11. Work a wet hair style that *isn't* just a messy topknot: Create three buns in the back of your head to distribute the weight of your hair (less likely to fall out!). Bonus: It'll totally create loose curls when your hair dries. Get all the info at Hair Romance. Try L'Oreal Paris Undone Air Dry Style Cream A so your hair is fab (not frizzy) when you take it out of the buns. Get it from Jet for $4.70. 12. 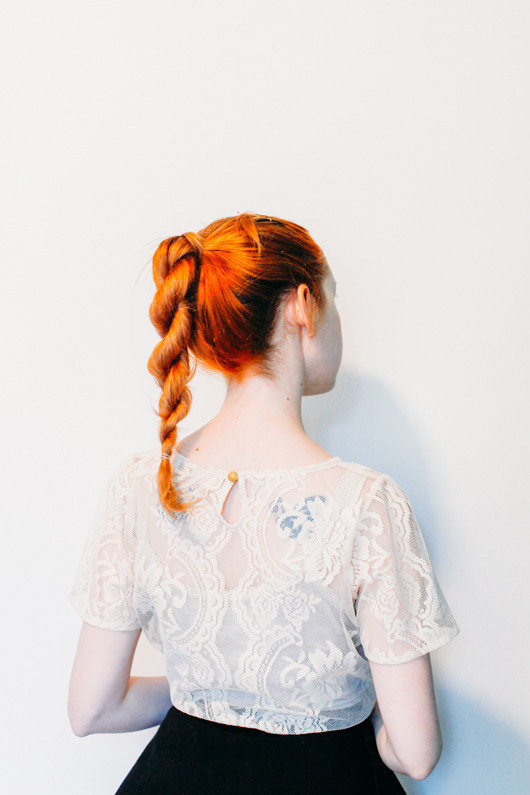 Cheer up your rainy-day hair by threading ponytails together to create a faux braid look. It looks really impressive, but is actually shockingly easy. Check out all the steps at Camille Styles. 13. Make a tiara out of ~your own hair~ by pinning pieces into a trio of buns across the crown of your head. Take a look at the full tutorial at Keiko Lynn. 14. Ditch the elastic and pin your hair back into a low pony to keep the volume (and your curls) intact for longer. Check out more gorgeous natural hairstyles at Loxa Beauty and get more hair inspiration from Samantha Harris's Instagram. To keep your moisture locked in, style your hair with AG Hair The Oil. Get it from Loxa Beauty for $18. 15. Turn up the volume of your messy bun updo with Velcro hair inserts and spin pins. Learn how to recreate it at Extra Petite. The Velcro hair bumps have barrette-style clips on the back, which make adding a little extra oomph to your ponytail, French twist, or bun insanely easy. 16. Perfect that done/undone look with a mini topknot, and keep those flyaways in place by using a twisting technique to ensure the bun stays together. Be sure to check out 26 Hairstyles You Can Create in 10 Steps or Less. 17. Sweep your braids or locs to one side, and twist the braids framing your face all the way down. Then just pull it together with a thick hair-friendly elastic and you're good to go! Try Burlybands instead of regular elastics — they are thicker than typical ones and will never slip, stretch out, snag your hair, or break. Get a set of three from Amazon for $10.99. 18. 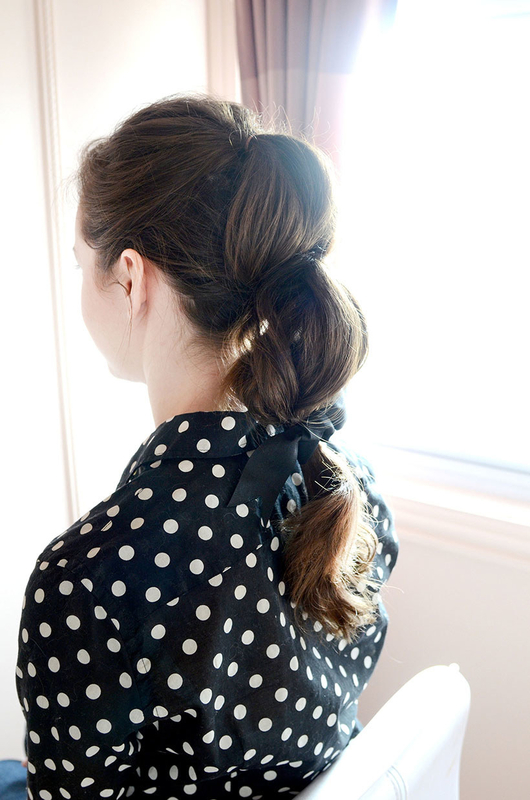 Braid back along the center part of your hair to make your ponytail look purposeful instead of last-minute. For an extra finishing touch, wrap a strand of hair around your elastic to hide it and pin in place. Learn how to do it at Missy Sue. And any time you include a braid in your hair, bump up the volume by trying a Dutch braid technique. It's the exact same as a regular braid, but upside down, so you can pull the braid apart to make it look way thicker. 19. Whip together an updo that looks intricate as heck, but is actually only three regular braids wrapped up and pinned to your head. Check out the steps at Paper & Stitch. If your hair won't snag on them, try clear elastics to hide the top of your braids from view. And if your hair is straight or feeling a little limp, add some texturizing hair cream beforehand to get mega fat braids. 20. Style your hair with a Khaleesi-inspired 'do that's deceptively easy. Spoiler alert: It's just two half ponytails flipped inside-out. Can you say Game of Thrones viewing party looks? Get the full how-to at Kokay. 21. Separate two sections of hair at the front, then braid each across your head for a built-in headband look that's simply stunning. Learn more about each step in 26 Hairstyles You Can Learn in 10 Steps or Less. 22. Twist your hair into a dreamily romantic updo straight out of a period-piece film (that doesn't require an entire team of hairdressers). All you need to do is create two braids (one on top and one on the bottom) and then twist them together and pin in place. I promise it's not confusing. Check it out at Hair Romance. 23. Boost the roots of your hair with an easy teasing technique sure to make people say, "OMG did you just get your hair done?" Learn more at Camille Styles. Get a highly rated teasing brush from Amazon for $5.89. Available in three colors. 24. Enhance your ponytail for a style you can wear to work, out to dinner, or even to a black tie event: Just twist two sections back, then tie your hair together (like the first step in tying a bow). Check out how to do it at Hello Glow. 25. Curl your hair in under two minutes: Gather your hair into a pony and wrap one half around a curling iron, then the other half. Take out the ponytail, and your hair will look like you JUST got a blowout. Take a look at all the info at Pretty Gossip. Get a highly rated tapered curling iron perfect for this look from Amazon for $23. 26. Braid back the front section of your hair, then loop it up with the rest of your locks into a go-to messy bun that says, "No, professor, I did NOT hit the snooze button 14 times." Get the full tutorial at Madokeki. 27. Add a head wrap as a finishing touch to your outfit — with these easy cheat sheets you can TOTALLY do it. Check out the full post of 8 Head Wrap Cheat Sheets You Can Do In 7 Steps Or Less for all the awesome looks! Get a highly rated head wrap from Amazon for $28.99. Available in eight prints. 28. Separate your hair into three or four sections, and then tuck and pin each one for a complicated-looking hairdo you can master in a couple of minutes. Check out all the details at Once Wed.
29. Perk up your pixie cut with a small-barreled curling iron and some styling cream. Learn how to recreate the look at ModCloth.